Galaxies have supermassive black holes at their centers—our Milky Way, for example, has its own 4-million-solar-mass one, Sagittarius A*. Some astronomers have previously thought that there’s a simple relationship between the galaxy’s size, the black hole’s mass, and how much light the black hole spits out while it eats up the things surrounding it. But a pair of papers studying the biggest star-eating behemoths imaginable seems to bust up that assumption. Two teams looked at different datasets to analyze galaxies and black holes in different ways. One measured the rate at which supermassive black holes grew compared to their hosts, using data from thousands of distant galaxies. 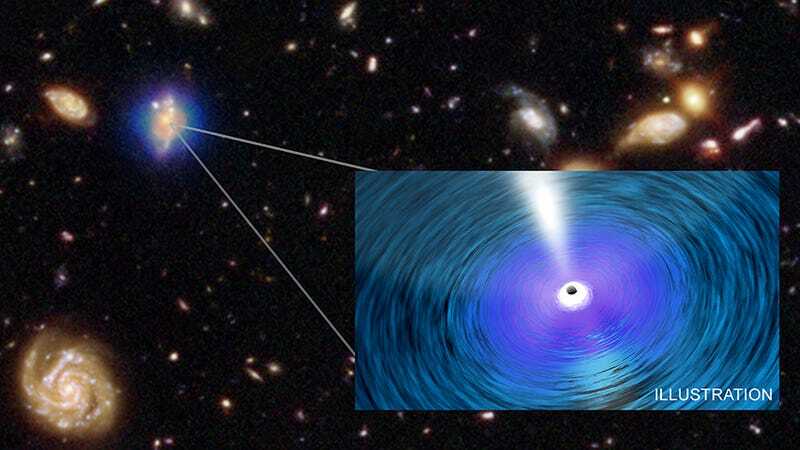 Another looked at how supermassive black holes’ masses related to their x-ray and radio emissions in the brightest galaxies closer to the Milky Way. In both cases, things were not what the scientists expected. This “implies that the black hole-galaxy scaling relations do not hold for these extreme objects,” wrote Mar Mezcua, first author of one of the studies form the Université of Montréal, in a blog post. Scientists have thought that black holes scale with the size of their host galaxies, explained Penn State astronomy graduate student Guang Yang in another blog post. That would be nice, since it would perhaps tell the story of a “common supermassive black hole-galaxy evolution,” wrote Mezcua in her paper published recently in the Monthly Notices of the Royal Astronomical Society. Both researchers’ data seem to throw some sort of wrench in the idea, though. Yang and his team compared the average rate that the supermassive black hole ripped stuff apart as it ate it up its host galaxy’s mass and distance. This data came from x-ray emissions recorded for thousands of galaxies by the Chandra X-ray Telescope, for galaxies whose light had traveled distances of 4.3 billion to almost 12 billion light-years. It turns out those black holes were growing much quicker than expected for larger galaxies. Mezcua and her team instead tested an assumed relationship between black hole mass and black hole x-ray/radio emission. They estimated the black hole mass of the brightest galaxies at the center of crowded galactic clusters, and they compared it to what the mass should have been based on the black holes’ radio and x-ray emission data. They found that the black holes in these clusters appeared around 10 times heavier than expected, some approaching the “ultramassive black hole” territory. Alastair Edge, one of Mezcua’s co-authors from Durham University in the UK, told Gizmodo that the black hole masses in their paper required the biggest assumptions. He felt it was a logical conclusion, but wherever there are assumptions there’s the potential for further study or ambiguity. Mezcua also felt that maybe black holes form rapidly first and then the galaxy forms later and more slowly. Or maybe galaxies formed around seed supermassive black holes early in the universe’s history. It’s happened once again: Scientists pointed their telescopes to the sky, and the largest black holes and galaxies refused to be fully understood.